A: Vehicles not having the advantage of batteries may very well have a reduced ability to reach high velocities. B: Vehicles with battery stores, will have the advantage and should be classified differently, for example an outright class. The UNSW Solar Racing Team (often known as Sunswift after the name of their first race car) is a solar car racing team from the University of New South Wales. The team has built four cars since 1996. 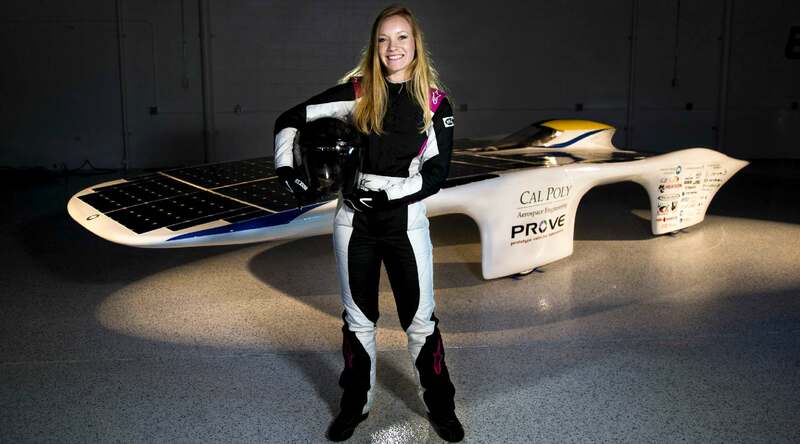 The most recent car, Sunswift IVy (or Ivy), is currently the top ranked silicon solar car in the world, following a win in the silicon class at the 2009 World Solar Challenge (WSC). Sunswift IV, Ivy was built for the 2009 World Solar Challenge. The car surpassed expectations by being the first silicon powered car across the line, coming 4th overall. On 7 January 2011 Ivy broke the 22 year old Guinness World Record by over 10 km.h. Australian racing driver Barton Mawer, driving Ivy, set a new Guinness World Record for World's Fastest of 88.5 km/hr at 10.32 am on the Royal Australian Navy airbase HMAS Albatross. The record was previously held by General Motor's Sunraycer with 1.5 kW of power and stood at 78.39 km/hr. Sunswift's Ivy used only 1.200 kW to create this record. The record required that Ivy be powered solely by the sun. With the entire battery pack removed IVy weighed only 140 kg. The Jaycar Sunswift III was designed for the 2005 WSC. Mechanical problems caused a crash before the race, and the car completed the course unofficially. The mechanics were improved for a second attempt in the 2007 race, which netted a respectable place in the Adventure class. Over seven years, from 1997 to 2003, the team developed, refined and raced four versions of UNSW Sunswift II. In 2000-2001 the team embarked on the TopCell project to manufacture buried contact solar cells to construct a new solar array. This makes the UNSW SRT the first and only team to have made their own solar cells. Along the way the team achieved a new world record efficiency for this type of solar cell. The remaining cells on UNSW Sunswift II are the world's highest efficiency "PERL" silicon solar cells, made at UNSW. The team also developed a revolutionary cell encapsulation technique which allowed it to mould solar panels to the curved shape of the car. The original Sunswift vehicle was purchased from the Aurora Vehicle Association in 1996. The car, Aurora QT, was significantly upgraded and improved by the UNSW SRT and renamed Sunswift. A new motor and controller, roll cage, chassis and batteries were added. Sunswift raced in the 1996 World Solar Challenge. The car was still a competitive entry despite its age, placing 9th out of over 40 entries. The experience gained from racing Sunswift inspired the development of Sunswift II starting in 1997. 1.1996 World Solar Challenge – Sunswift finished 9th out of 46 entries. This was the University’s first entry in a solar car event amongst the prestigious and competitive entries from Honda Motors Corporation, the Swiss entry from Biel, and Mitsubishi Materials Corporation. 2.1999 NRMA Transcontinental Record Attempt – with the car NRMA Sunswift II completed 4,012 km in ten days despite five days of bad weather. Even though the record of 8½ days was not broken, the attempt was still regarded to be a success with $2.4 million worth of publicity generated. 3.1999 CitiPower SunRace – three days after completing the Perth-Sydney record attempt the team entered this event. NRMA Sunswift II obtained third place in a highly competitive field of five entries, proving the car’s reliability and the team’s dedication after five continuous weeks on the road. 4.NRMA Sunswift II participated in a trade exhibition in Taipei, on request from the Federal Government. 5.1999 World Solar Challenge – NRMA Sunswift II finished a respectable 18th out of 48 international entries. 6.2001 World Solar Challenge - UNSW Sunswift II was the 11th car to cross the line. 7.2005 World Solar Challenge - UNSW Sunswift III was the 9th car (and the first with silicon solar cells) to cross the line, arriving in 5 days. 8.2007 - Jaycar Sunswift III broke the world record for a solar car journey from Perth to Sydney. The team finished the journey in 5.5 days, breaking the previous record by 3 days. 9.2007 World Solar Challenge - Jaycar Sunswift III finished 4th in the Adventure class and 9th overall at 4:11pm on 26 October. The team was awarded with the prestigious Freescale Technical Innovation Award for the high efficiency of the vehicle. 10.2009 Global Green Challenge (World Solar Evolution) - Sunswift IV finished 1st in the Silicon Challenge Class and 4th overall at 3:08pm on 29 October. The content of this website is copyright © 1991 and 2019 Electrick Publications. All rights reserved. The bird logo and name Blueplanet Ecostar are trademarks. The Blueplanet vehicle shape and configuration are registered designs ®. All other trademarks are hereby acknowledged. Max Energy Limited is an educational charity.